Cranberry (Vaccinium macrocarpon) is one of the most widely used urinary tract antiseptics among natural health care enthusiasts and in the health food industry. Its efficacy lies in its broad range of constituents, most notably soluble proanthocyanidins (PACs). Of specific interest, is that many of the newer studies reveal insights into the compounds responsible for the bacterial anti-adhesion activity, which contributes to the beneficial effects of cranberry on urinary tract health. This allows for greater specificity in quality control of cranberry products. In this regard, there are numerous methods that can be applied for quantitation of the various active compounds. However, not all cranberry products are created equal. Numerous products are made from byproducts of the cranberry juice industry (pressed skin and seeds) and are often sold alone or mixed with juice preparations. Unlike the juice, press cakes contain mostly insoluble PACs that are not equivalent in urinary tract anti-adhesive activity to the soluble PACs. Importantly, many analytical methods for PACs do not differentiate between soluble and insoluble. Therefore, distinctly disparate products with widely varying levels of efficacy can conceivably be traded side by side but labeled to contain the same amount of total PACs. Products made using ingredients that are byproducts of juice production are less expensive than pure juice products. While these products are not devoid of benefit, they cannot be considered equivalent to pure juice products in terms of their effects on urinary tract health. 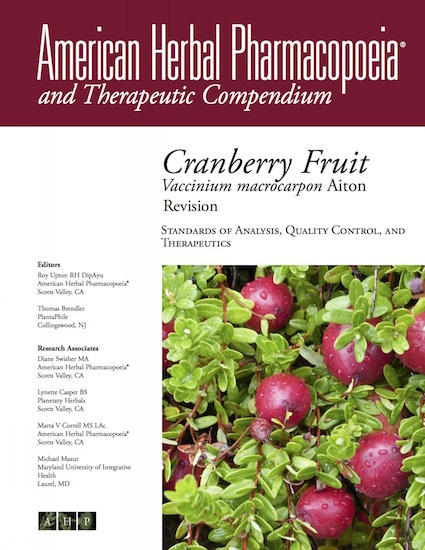 The AHP monograph also reveals findings regarding gross adulteration of cranberry products, predominantly extracts, including what those adulterants are and how they can be detected. It is important for product developers, health professionals, patients, and educators to understand the subtle differences between the different types of cranberry preparations available. Newer studies have also looked at putative cranberry-drug interactions, most specifically with blood thinners, which previously caused FDA to issue a warning regarding cranberry use. These issues are addressed in the monograph.